The quartet of Ironsi Roberts, Eldin Francois, Bradley Glasgow and Albert Daniels conjured up and audited their table tennis talent to land KPMG the 2006 Scotia Bank Firms team title. KPMG crowned off their campaign with the doubles accolade. Roberts and Daniels blanked the all Police pair of Junior Simmons and Rodney Caruth 11-9, 15-13 in a very competitive final. Caruth then humbled Simmons 11-6, 11-5, 11-5 to take the singles title. RSVG Police took the runner up spot, and Computec Irie Travel placed third in the team championship. Junior Byron Cox of Media House secured the third spot in the open singles. The other team title hand out at the presentation ceremony that followed the finals was taken by SG De Freitas. They were adjudged the Most Improved Team. But the Most Valuable Player award was stashed away by Daniels. This yearâs competition restricted any current or past national players from participating. 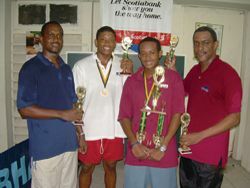 The competition was organised by the executive of the St. Vincent and the Grenadines Table Tennis Association.